Subak is an organization owned by the farmers in Bali that specifically regulates water management or watering systems/irrigation of rice fields traditionally, the existence of Subak is a manifestation of the philosophy/concept of Tri Hita Karana. Parahyangan is a harmonious relationship between human and God. Pawongan is a harmonious relationship between human and his neighbor. Palemahan is the harmonious relationship between human and nature and the environment. The word "Subak" is a word that comes from the Balinese language, the word was first seen in the inscription of Pandak Bandung that has numbers 1072 AD. The word "Subak" refers to a unique social and religious institutions, has its own settings, democratic associations of farmers in determining the use of irrigation water for growing rice. Subak for Balinese is not just an irrigation system, but also the concept of life for the people of Bali itself. In the view of Balinese people, Subak is a direct overview of the philosophy of Tri Hita Karana. As a method of arrangement of living together, Subak survived for over a century because of the people obedient to the ancestral traditions. Water distribution is done fairly and equitably, all the problems discussed and solved together, even the timing of planting and determination of the type of rice planted was done together. Sanctions against various types of violations will be determined by the people themselves through ceremonies or rituals performed in the temples. This kind of harmonization of life is the key factor in the preservation of the cultural of Subak in Bali. Krama Aktif is the active members such as krama pekaseh, sekaa yeh or sekaa Subak. Krama Pasif is the members that replace their obligations with money or in kind for several reasons commonly referred to Pengampel or Pengohot. Krama Luput is the members which is not active in all sorts of Subak activities because of the duties as head of the village or Bendesa Adat. Pekaseh/Kelian is served as head of the Subak. Pangliman/Petajuh, served as deputy head of the Subak. Peyarikan/Juru tulis is as secretary. Petengen/Juru raksa is has a duty as treasurer. Saya/Juru arah/Juru uduh/Juru tibak/Kasinoman has the duty in matters of notice or announcement. Pemangku is a special duty in matters of ritual or religious events. Sekaa Numbeg is a group that regulates the processing of land. Sekaa Jelinjingan is the group in charge of organizing the water treatment. Sekaa Sambang is the group who has the task of monitoring the water of the theft, banish or catch animals that destroy crops such as birds and rodents. Sekaa Memulih/Nandur is a group in charge in terms of planting rice seedlings. Sekaa Mejukut is a group in charge of weeding rice. Sekaa Manyi is the group in charge to cut or harvest rice. Sekaa Bleseng is a group that has the duty of transporting the bond of rice that has been planed from the fields to the barn. As an organization that is autonomous in taking care of their own organizations, Subak can set rules known as Awig awig, Sima, and Perarem. Inside the awig awig written things and basic provisions, the main contents in awig awig is set about parahyangan, pawongan and palemahan while provisions and things in more detail contained in pararem as the implementation of awig awig Subak. Awig awig Subak contains rights and obligations of members of Subak and contains about sanctions for violations of rights and obligations. Experts also mentioned that Subak, as well as technological systems, has become a culture in Bali. Subak as a method of the technology of the original culture of the Balinese farmer. 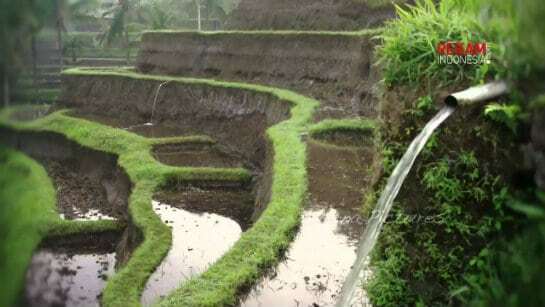 The main facilities of irrigation water control system (palemahan) for each member of Subak is pengalapan (dam), jelinjing (trenches), and a cakangan (spot/tool to enter the water to the rice fields). if at a given location rice field there are two or more adjacent cakangan to each other, then the height of those cakangan are the same (the ease and smoothness of the water flowing into the fields owned by each farmer is the same), but the difference in the width of the holes of the cakangan can be tolerated customized by a wide margin of paddy fields. Manufacture, maintenance, and management of the use of irrigation facilities of Subak conducted jointly by the members. Empelan/Empangan as a source of water flow/dam. Bungas/Buka as an inlet (in take). Aungan as a closed drains or tunnel. Telabah Aya (gede) as the main water channel. Tembuku Aya (gede) as the main building for the distribution of water. Telabah Tempek (Munduk/Dahanan/Kanca) as the branch water channel. Telabah Cerik as twig water channel. Telabah Panyacah (tali kunda), in some places known as Penasan (for 10 parts), Panca (for 5 people), and Pamijian (1 person). 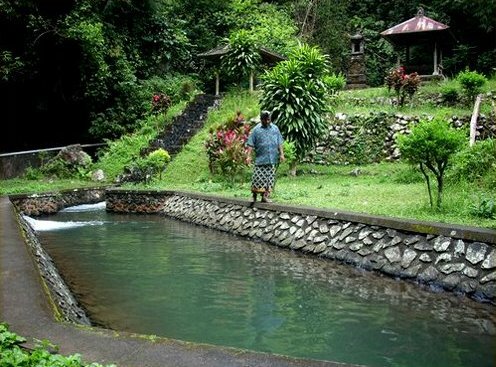 Through this Subak system, farmers get water in accordance with the conditions set by the deliberation of the members of Subak and still guided by the philosophy of Tri Hita Karana. Therefore, the activity in organizations/associations of Subak includes not only agricultural issues but also includes issues of ritual and worship to invoke good fortune and fertility. Rice field, rice plants, and the water has an important role in Subak irrigation system is even associated with a religious aspect. All those three are related to the power of Dewi Sri (the goddess of fertility and prosperity). Therefore, Subak not only regulates the issue and delivery of water but also the social and religious aspects. Each Subak usually has a temple called Pura Ulun Carik Temple or Pura Bedugul Temple, specially built by farmers to worship the Goddess Sri. This irrigation system is governed by an indigenous leader and also a farmer called Kelian (Klian) which has the job to supervise and manage Subak. To be Kelian Subak is a social nature, does not get a salary. The division or distribution of water is adjusted to the membership of farmers in Subak, there are active and passive members, both got different water distribution. This is the basis of justice where the water distribution adapted to the contribution. The ancient irrigation system of Subak has been studied and researched by Clifford Geertz, while J. Stephen Lansing has attracted public attention on the importance of traditional irrigation methods. He studied and researched many sacred places (temples) in Bali, especially the sacred place reserved for agriculture. In 1987, J. Stephen Lansing cooperate with farmers in Bali has redeveloped in the irrigation system/Subak irrigation becomes more effective. That way he can prove how the effectiveness and importance of Subak irrigation method in Bali. UNESCO - The United Nations Educational, Scientific, and Cultural Organization has finally admitted Subak in Bali as a world cultural heritage. Such recognition can be realized after the struggle of Indonesian republic government for more than 12 years. Proposal for this category is not easy because it requires in-depth research with the approach through various sciences such as archeology, anthropology, geography, environmental science, landscape architecture, and some other related sciences. Right at the date June 29, 2012, the Proposal is approved and designated as World Cultural Heritage by UNESCO in the 36th session of UNESCO World Heritage Committee in the town of Saint Peterburg, Russia. The determination as a World Cultural Heritage was welcomed by the government and the people of Bali. According to the filing, Subak in Bali which has an area of ​​approximately 20,000 ha, consisting of a water control system that is in 5 districts of Badung, Bangli, Buleleng, Gianyar and Tabanan. Ulun Danu Batur Temple, located at the end of the lake Batur, which is the main water temple as the source of any springs and rivers. Subak Landscape of watersheds Pakerisan, which is known as the oldest irrigation system in Bali. Subak Landscape of Catur Angga Batukaru, tourist attractions of Jatiluwih rice terraces is one of its parts. Taman Ayun Temple, the greatest water temple with its most famous architecture, exemplifies the full expansion of the Subak system under royal government of Bali in the 19th century. The components of Subak is covering the forests that protect water supplies, landscapes of terraced rice fields that are connected by a system of canals, tunnels and dams, villages, temples of various sizes indicating the importance of water resources or water flowing through the temple declined irrigating water control system. To introduce and preserve Subak which is an ancestral cultural heritage of Bali, then established the Subak Museum which is located in Tabanan regency which aims to introduce young generation or tourists about the traditional irrigation system owned and is still used today by the farmers on the Island of Bali. Read more about Subak Museum: Bali Agriculture Collection & Traditional Irrigation. In this museum exhibited and displays objects that relate to the work of farmers as well as audio-visual shows activities in running Subak irrigation management.